So this is it. Another beginning. And now rather than my once typical raw canvas, it’s a triple primed canvas with a ground of troweled Titan Buff, and two applications of Zinc White. The move to working on primed canvasses and developing a ground to host my endeavors, hasn’t come easily. I use a variety of media in my work . 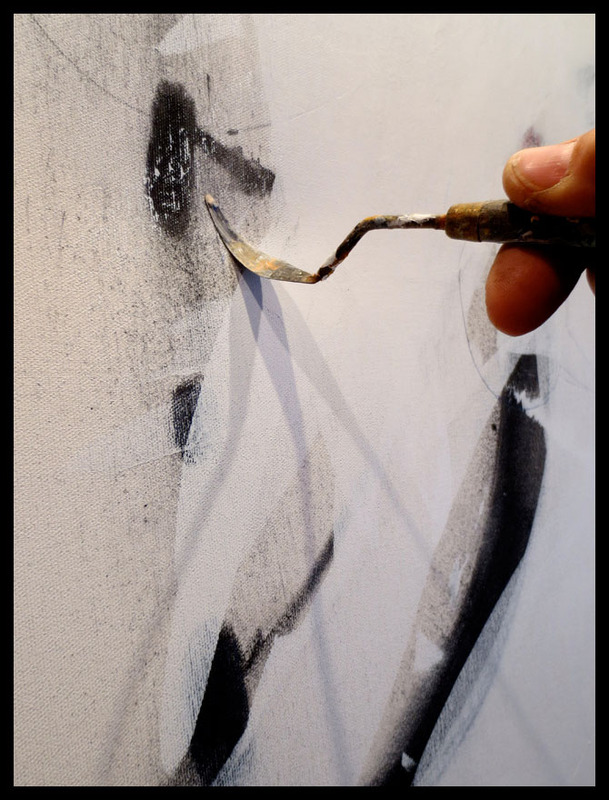 . . acrylics are the mainstay, but also dry pigment, graphite, and pastel, each requiring something to hold them in place. The problem being, the fixative altering the color of the raw canvas. After Blair reformulated my fave #105 “No Odor Spray Fix” (to my mind the perfect fixative, other than the potential of cognitive dysfunction and the environmental damage its use might promote) the experimentation has been on . . . sprays, brushed on varnishes, and aerosols. Each in their own way, altering the very properties of the canvas “au naturel” I desired. So this is it. Titan Buff mimics the hue of raw canvas. The transparent layers of Zinc White allow the warmth of canvas to peek through, and my current fixative of choice, a milk based protein in grain alcohol, has no noxious orders or unhealthy fumes. Off to install my work at Citizen Espresso Bar. I do like everything in its place. A cigar box from my father’s workshop appropriated for picture hanging what nots. A trusty measuring tape, upholstery hammer, multi-tool, brass hardware, screwdriver, mini-level (all on the up and up) and the magic triangle measuring mistake eraser, all housed in an old doctor’s satchel . . . and I’m on my way . . . So please come join in, just click here for an invite. One of the things that has me excited about the new canvasses, is having more acreage for my explorations. Actually forty-four percent more surface area than the canvasses I used in the last series of paintings. On those canvases, it was all brush work, partly because of their size, but also because these compositions are an assemblage of interlocking patterns and shapes drenched in color, and were best brought to life through the end of a brush. 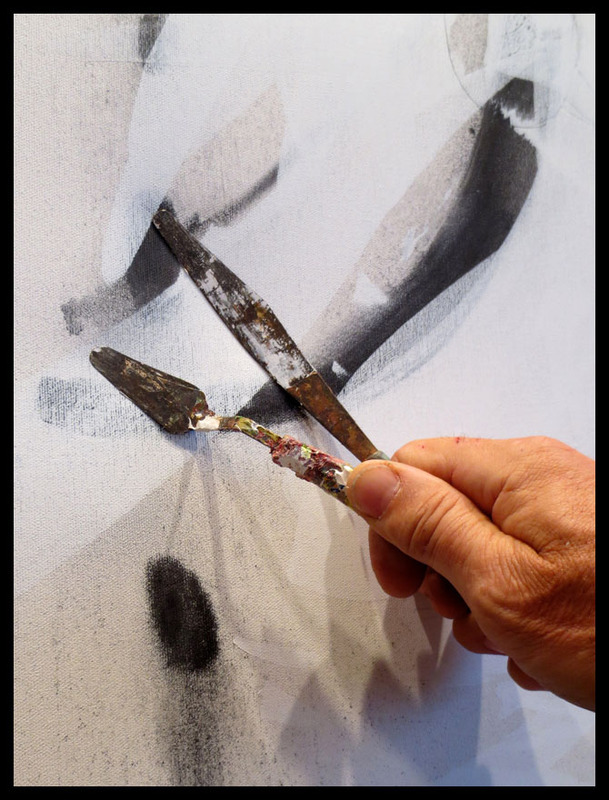 Now with a move toward opening up the space within the painting and the extra expanse of the larger canvasses, it’s knife and trowel work. I keep an assortment of palette knives at hand, mostly for mixing color, but when the occasion occurs I’ve supplemented these traditional painter’s tools with trowels and putty knives appropriated from my home workshop. 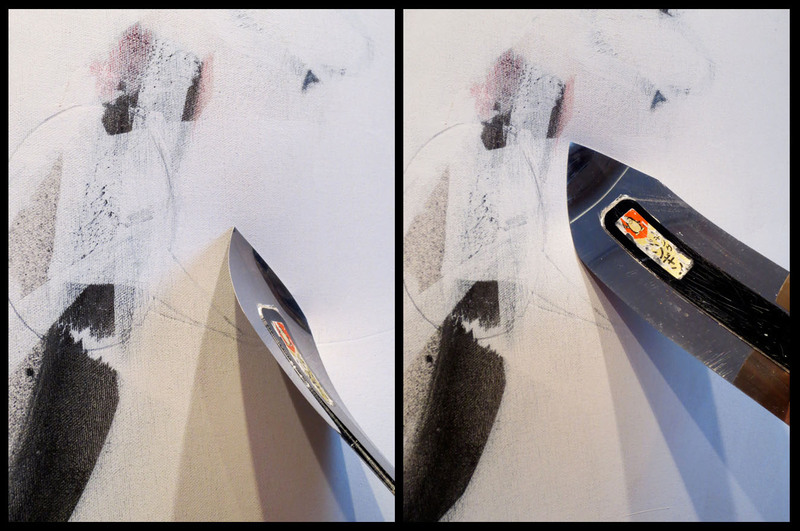 One of my all time favorite’s is this ultra thin, highly flexible stainless steel Japanese trowel. This trowel is normally used for smoothing fine finish plasters. Its flexibility and pointy tip make it a superb tool for everything from applying large swaths of color to carving delicate lines. For scraping and burnishing depending on the surface needing more aggressive attention. Remarkably these tools are significantly less sensitive then the Japanese trowel but lend themselves to working those minimal problem regions. Then for those tiny sensitive bits, this little guy. It isn’t all cold steel, there is still plenty of brush work on the horizon, but I am enjoying the big sweeping gestures made possible with room to move.